The word setback is a technical term widely used in architectural and construction circles, but it is often deeply opaque to people outside those professions. It simply refers to the required distance between property lines and buildings (or certain other structures) on a property. In most City of Los Angeles zones, a building cannot be located right on the property line. It must be set back a certain distance from the property lines. You’d think this is a simple concept to master and use, but remember, this is the Los Angeles zoning code we’re talking about. The physical, printed zoning code is the size of a bible, and for a reason. What can go in a yard? It depends. The Los Angeles zoning code calls the area between the property line and the building a yard. A property in a typical R1 zone might have a required front yard depth of 20 feet, a side yard depth of 5 feet, and a rear yard depth of 15 feet. Those “yards” are generally considered by the zoning code to be areas where no structures are allowed. ￼This being Los Angeles, however, there are exceptions, modifications, and additional requirements that vary according to location, sub-zone (such as Hillside), the size and height of the building, and the type of structure. Fences, for example, are a type of structure that are allowed within front, side or rear yards, but their heights are controlled according to location or zone type. Decks and detached garages are also allowed within yard areas, but there are limitations there, too. Understanding setback requirements can be a challenge. In general, understanding the zoning code’s setback requirements, as with other rules (such as height), can be an exercise in Talmudic reasoning–sometimes weighing one requirement against another, with a decision often hinging on a proper interpretation of a minute technical detail in the code (or on previous interpretations of the code by the Planning Department). According to Wikipedia, the Hebrew term pilpul (Hebrew: פלפול, from "pepper," loosely meaning "sharp analysis") refers to a method of studying the Talmud through intense textual analysis…–and we use the same method with the Los Angeles zoning code. 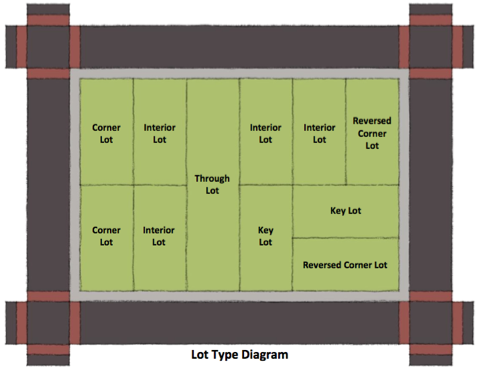 For example, the code says that a house in a regular R1 zone might have a required front yard (or front yard setback) that is either 20% of the lot depth, or 20 feet (the maximum required), or matching the “prevailing setback” in the neighborhood. This last one is particularly tricky because it is based on measuring the front yard dimensions of all the houses on a block, from one intersecting street to the other, and then running those numbers through a complex formula provided by the city to generate a dimension which the city calls “prevailing.” (The idea is to keep a new house from being built closer to the front property line than most of the older houses on the block.) The city even provides a specialized on-line worksheet tool to help calculate this dimension. ￼Another example: a house that is built to a certain height might have one required side-yard dimension, and if it is built higher, another. In certain situations a house with a flat (or low-slope) roof may technically have a different maximum building height than one with a pitched roof, and the side-yard dimensions must then be adjusted according to the building’s height. Setback rules can have even more variations and conditions. The R1 setbacks can be different if the property is a Through lot, a Key lot, or in a Historic Preservation Overlay Zone, or in a Hillside area, which has its own requirements, or in the Coastal zone, where additional restrictions may apply, or on a lot fronting a Substandard Hillside LImited Street–and there are several other zones, or overlay zones that carry special setback conditions as well. All of these conditions apply not only to lots in the R1 zone, of course, but to all of the 15 different zones that allow single family residences, each with its own specific rule combinations, and several with interesting variations besides. ￼That’s a brief overview of residential property-line setbacks in L.A. This is one of several zoning-related areas that an architect examines in detail at the start of a project, or when a project is contemplated. It explains why, when asked whether a house of a certain size can be built on a particular lot, an architect may delay his or her response. The final answer requires study, review, and pilpul. To help with this, my office uses a structured, sequential checklist that systematically steps through all the variables, accumulating bits of data that are all added up at the end to provide an informed answer. The Zoning Ordinance Is Normally a Clear Concise Document with Liberal Cross References, and with Some of the Amendments Pasted In.